Thanks to the hard work of my husbsand robert over the past few hours, my sukkah is almost complete. fortunately, we have a screened in patio at the back of our house wich is eight by 30 and big enough for a crowd or just the 3 of us as needed. He removed everything and used outdoor clorox a scrubbrush and hose to clean it. then, he cut down palm branches on our property and asked a few neighbors if he could cut theirs (living in florida makes this soooo easy) and laid them over a few firring strips on top of our screened in porch! Voila! Bow i must get shopping and cooking. Oh maybe an extra table for guests! Keep away the RAIN PLEASE! 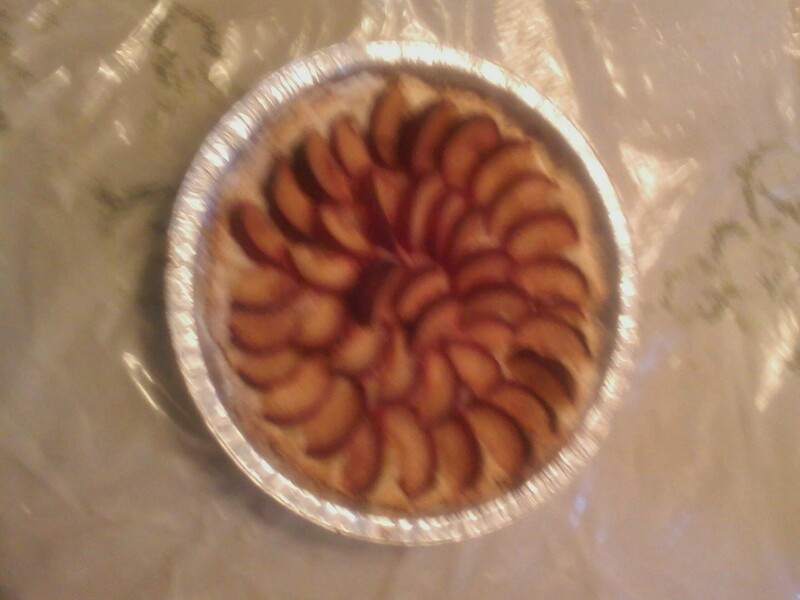 Pflaumen Kuchen Plum Tart Must have got Rosh Ha Shana!! This recipe was one my mother made every year for the Jewish holidays. I always thought of our familiy as gastronomic Jews rather than Reform, Conservative or Orthodox. Now we are considered Orthodox. The Muerbeteig dough mush be mixed up and chilled for at least half an hour before it is patted into a pie pan and filled with the fruit and baked. Make sure you allow enough time for the chilling’. To make this Pflaumen kuchen, you need to cut up at least 8 of the Italian prune plums which are generally in season this time of year. I have not found any in South Florida so I have bought the black Plums at publix and hope for the best….Pics to follow!